of 3769.08 and 3769.083 of the Ohio Revised Code in the 106th General Assembly. The goal of the OTRF is promote Ohio's Thoroughbred horse racing and breeding industry through the creation of incentives for owners to race horses bred or foaled in the state. 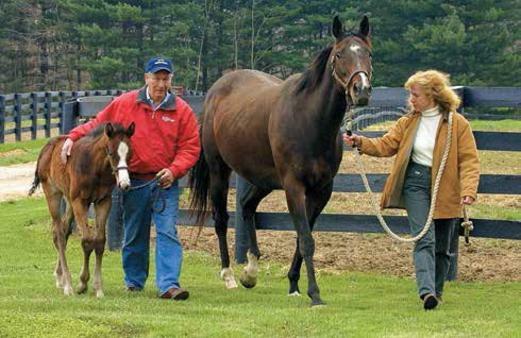 Since 1965, over 25,000 Ohio-eligible horses have been foaled. The OTRF program is comprised of broodmare and stallion awards, open allowance supplements for Ohio-bred horses winning in open competition at Ohio tracks, and purses for stakes and races exclusively for Ohio-bred Thoroughbreds. The Best of Ohio races offer $150,000 in purses. The fund also supports promotion of the state's Thoroughbred industry. Please note: Applicants for a breeder license are required to submit a separate check and may not add the cost of the breeder license application to any OTRF payment. For information, contact Greg Veit, OTRF Administrator at 614-779-0268 or greg.veit@racing.ohio.gov. Broodmares must be registered or renewed and RESIDE in Ohio by August 15. Ohio's top runners were showcased on Oct. 13, 2018 at Jack Thistledown, featuring winners Mo Don't No, Altissimo, Takechargedelilah, Altissimo & Drillit in five $150,000 Stakes: Best of Ohio Sprint; Best of Ohio Endurance; Best of Ohio Distaff, Juvenile Stakes & John W. Galbreath Memorial.